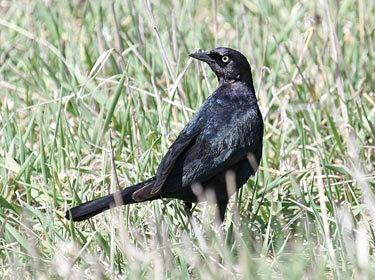 Description: Male is black overall year round, with a purplish metallic sheen on head and neck, and a metallic green sheen on body and wings; yellow eyes. Occasionally fall males show buffy feather edgings, but never as rusty as in Rusty Blackbird. Female is grayish-brown overall; dark eyes. Juveniles are similar to female. Behavior: Often seen foraging in large flocks with other blackbirds. Especially prefer areas with a combination of grass, scattered shrubs or small trees, and nearby water. 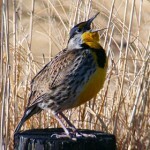 Habitat: Migrants are usually found in pastures, barnyards, and grain fields. 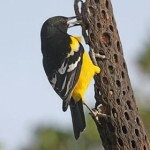 Breeding birds prefer low-stature grasslands such as mowed roadsides, residential areas, and farmsteads. 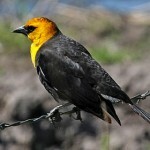 Where in Nebraska: Common spring and fall migrant across the state, becoming abundant in western Nebraska. Summer resident in west. Infrequently overwinters. Fun Facts: Most birds fly south for the winter, but a small number of Brewer’s Blackbirds fly west towards coastal regions of British columbia.